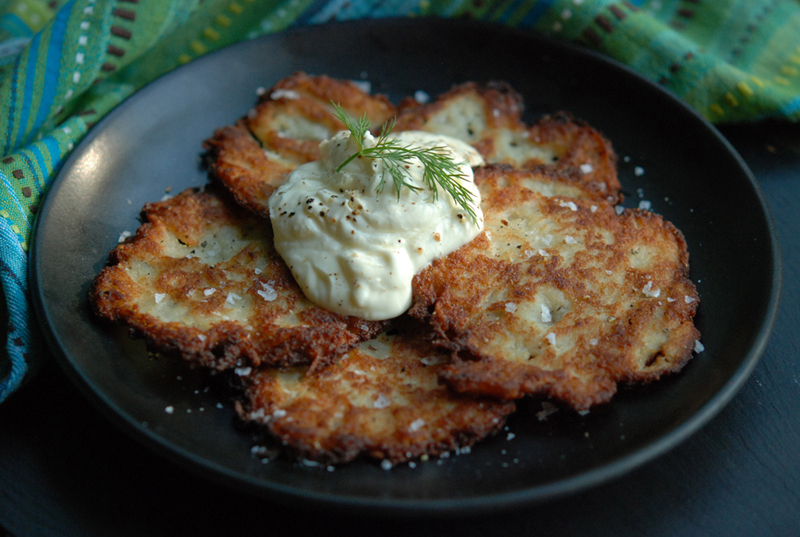 These potato latkes are so good that posting the recipe alone is a mitzvah (blessing) of the highest order. The Festival of Lights refers to a lamp in the temple that was supposed to have only enough oil to last the Maccabees one night, but instead lasted for eight. The holiday celebrates the miracle of the oil, so fried foods are often featured at Hanukkah feasts. Problem is, most potato pancakes, or latkes, are awful. Luckily for you, these are amazing. MAKE AHEAD The fried latkes can be kept at room temperature for up to 4 hours. Reheat them on a baking sheet in a 375° oven for about 5 minutes, or until warmed through and crisp.